On December 15th, 1967, the Silver Bridge collapsed. The accident killed 46 people with two of the 46 missing. However, this disaster isn’t as simple as it may appear. During the previous year, media had blown up in this small area about the strange things happening, and whether or not it had any connection to the bridges collapse. This creature tied to the disaster was first spotted on November 12, 1966. In Clendenin, West Virginia, five gravediggers spotted a large man like creature flying over the trees. And then again on November 15, 1966, two couples spotted the creature at an abandoned TNT plant. They’d stopped to see what it was, and when it turned around, they reported seeing two large red eyes on the large six to seven-foot-tall creature. On its back, they said that they also saw two large folded wings. Terrified, the couple sped away, but the creature was quick to chase after them. When reporting this to the police, they recounted going well over 100 mph as the creature chased them; however, this didn’t detour the large man like beast. On that same night, another sighting occurred. A Salem contractor was watching his television when it had shut off, and instead was replaced by a bizarre image. He also began to hear a loud whining sound from outside. He grabbed a flashlight to investigate the strange sound coming from his barn, and when he pointed his light towards the barn, it hit two large, red, reflective eyes. Bandit, his dog, took off after the creature and would not turn around to come back when the man called him. Frightened, the man retreated back into his house to retrieve his gun, and once it was time to return, gun in hand, he found himself too scared of the creature to go back. Instead, he went to bed. He slept with his rifle by his bedside that night. Along with these frightening encounters, came other strange phenomena. Many people recounted seeing strange glowing lights in the sky, as well as UFOs and strange, unidentifiable people. 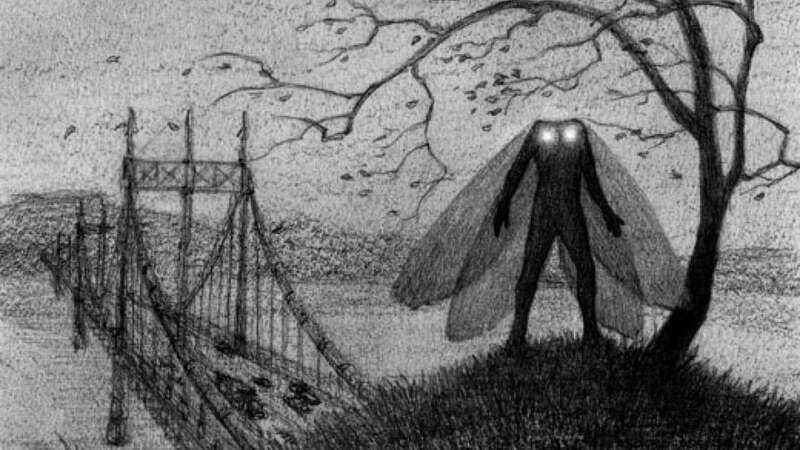 Many people tie the disastrous events which came a year after to the mothman and other strange occurrences. Some say the large winged man had come to warn them, and some say that his appearance is what caused the collapse of the bridge.